Today I went through this situation. Rims are Vzan Action with Formula Hub 36 holes. My rear tire was leaking. A guy patched up the tube and the problem persisted. I went to the bike shop and asked to check the patch, and as done, I went to a gas station, where I usually inflate it (only this year more than 2000km, most of the inflations were done at this station), and after inserting 65 psi and the valve, the tube EXPLODED. Out of luck it was just that, but I bet everyone heard the sound 2 miles away. The tire was apparently no damaged. I returned to the shop with the intention of changing the tube (I already had another one, I wanted to mend that one to make it last longer), but on the way I saw the real damage. The side of the rim was EXPOSED, completely disabling the wheel. 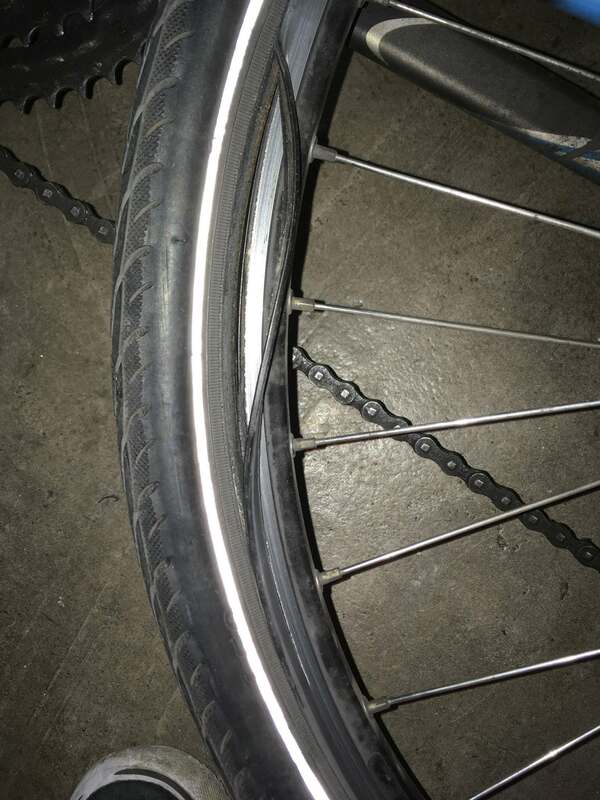 At the bike shop, they said it was my fault for inflating in a gas station, and they did not offer me an apology, or even a discount for the assembly of a new wheel. Soon I visited another bicycle shop where the owner informed me that the problem was that the tube was folded. And he also noticed that the side of the tire was damaged and that I would have to discard it, or it would compromise the tube in the future. I would like some opinions from you. Was it my fault, afterall? If so, how can I check if its safe to ride? I really like this tire and I did not want to get rid of it like that. It is being used since April. Can I still use it? Please check the images below. Can I use the spokes of the old wheel? The hubs could, and should, be used, right? Or should I go ahead and buy a pair of new wheels? Here are some images to illustrate. Update: analyzing some Youtube videos, I think the explosion happened from excessive stress on the rims. Plus, it wasn't completely true, and brakes pads were touching them at some points. I think that brake pads were bad positioned in the moment, or wore the wheels, or made then weaker in certain spots in the long run, making a crack or making the tube pop and explode in that direction. I'm almost surely buying a new pair of wheels, which will cost me basically the same price of a single one in the bike shops that I went. I don't know what kind of air pump you were using at the gas station. If it was a manual one with just a pressure gauge attached, you can usually use them if you are careful enough. Automatic air pumps, however, usually have the habit of using this three step algorithm: 1) open the valve to fill some air for a fixed amount of time, 2) measure the effect, 3) correct the error. Problem is, that step 1 is adapted for car tires with their immense volume, so it will over-inflate the tire if the pre-pressure from the pump is high enough. Typical pre-pressure from pumps seems to be around 100psi (my experience), but it can be anything. If your tube has a dunlop valve, that extra pressure will remain in the tire. So, don't use automatic pumps, especially not with dunlop valves. The maximum force that the rim can withstand reduces over time if you are using a rim brake on that rim. It's not just the brake pads that wear away, it's also the rim. Give it enough wear, and it will even explode at its originally rated pressure. I'm not sure whether that's the case with your rim, though. The force the tire's bead exerts on the rim depends on both the pressure and the width of the tire. The wider the tire, the more the tire will tear on the rim's edge. Your tire seems to be of the wider kind, so, even if the rim could bear a slim 100psi tire, 100psi with your wide tire may have been too much for it. The force on the rim is independent of the tube. The tube is not designed to withstand any forces, the only force that it exerts is the pressure of the air. Whether the tube is folded or not does not change this pressure. So, the opinion of the second bike shop seems to be wrong in this regard. So, what does that mean for repairing your tire? Well, obviously, you need a new rim. Looking at the damages to the rubber covering the bead, I would have trouble trusting the bead to remain seated: I would think that the rubber between the bead and the rim does help keeping the bead in place. Without that rubber, I would fear that the bead might have an easier time slipping over the rim. So, I would replace the tire if I were you. Regarding replacing the rim/tire/tube vs. just replacing the entire wheel, it's a lot of work to rebuild a wheel. If you don't do that yourself, buying a new wheel should be cheaper unless you have a sufficiently expensive hub like an internal gear hub to set off the expenses for work time. It's not 100% clear from your pictures and description, but it appears that the rim failed at the outer radius of the "working" portion of the brake surface. This is consistent with failure due to rim wear, a relatively rare condition only because few bikes are used enough to wear out the rims. How many miles do you have on the bike? Have the brakes been professionally maintained, or did you (or a buddy) do all the adjustment. Poorly adjusted brakes can exacerbate the problem, as can wearing the pads all the way down to the metal. Inflating with a gas station hose is not the wisest thing to do, but is unlikely to have caused the failure. Unless the rim is already compromised, the tire will fail from overpressure far sooner than the rim. Inflating the tire with a powered compressor meant for cars is not a great idea. I would not trust the pressure gauge to be accurate and they can deliver more pressure than a bike tire (or rim) can withstand. Use a pump designed for bicycles in future. You cannot pin any blame on the first bike shop, nor do they owe you an apology. You asked then to check the patch on the tube and they did that. A leaking patch can't blow up your wheel. Re-using the hub and spokes is probably not worth it. You would have to pay a wheel builder to build a new wheel re-using spokes, hub and a new rim. It's more cost effective to just buy a whole new pre-built wheel. The tires may be OK, as the carcass and bead seem to be intact, just the rubber outer layer seems to be damaged. However, I personally would not risk it and I'd replace the tire. Most of the answer seem to be based on the idea that to replace a rim, you have to completely disassemble the wheel and build a new one from used parts. This is not exactly true: you can replace the rim by taping a new one to the side of the old one and then moving spokes over one by one. This is far less work than lacing a wheel from scratch and the spokes remain in the same position where they have already settled, minimizing the risk of additional metal fatigue. In a comment it was mentioned that the shop offers a discount for using the old spokes. It sounds like they are planning to do this instead of rebuilding the wheel from scratch. I would recommend taking the offer. In my opinion the tire is gone. Not only the bead is damaged, but there are also visible cracks on the sidewalls. This kind of damage is often caused by too low pressure, and hitting an object with rim may have damaged it, too. Tire appears to me to be completely gone. It is hard to tell about the rim, in the first pic, it appears to be a total lose. I have a hard time imagining a rim failing, though. Can you add a pic of the rim without tire, in the area of damage? Check the brake pad setup, make sure they are not touching the tire. If they do, they will "score" the tire and cause it to fail. Rebuilding the wheel is a good choice, I would recommend keeping the rear hub. It has the cog set you want, all the spacing for the frame, derailleurs, etc are correct already. You can reuse the spokes, but I recommend against it. They tend to break after being in wheel, then de-tentioned, and re-stressed. ( a wheel does not support it's load thru compression, but reduction in tension ). 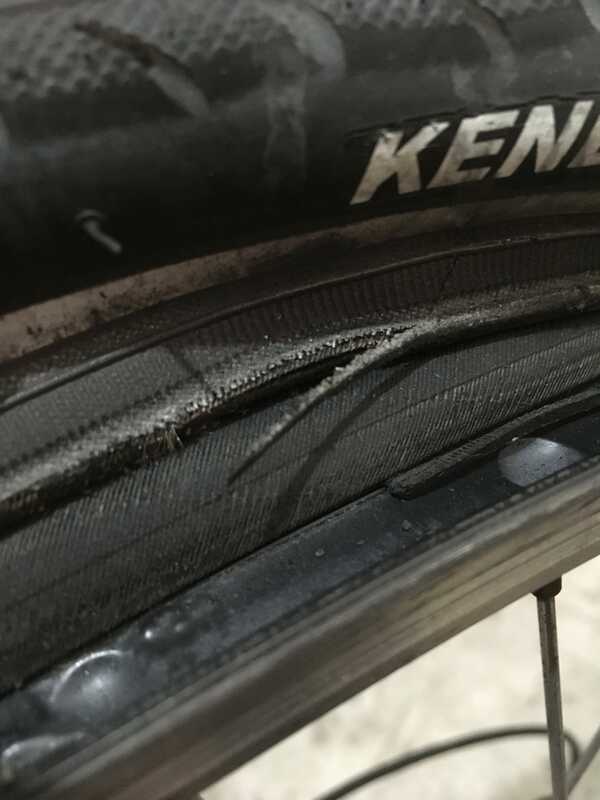 Bike shops: at third hand, it is hard to tell, but if you are relating things well, I am not comfortable with either ( 10 years in a bike shop in my early years.... ) I have never seen a rim fail from tire pressure in all that time. Not saying it cant happen, but the tire / tire bead is the weak spot in all this. Not the answer you're looking for? Browse other questions tagged tire wheels rims spokes inflation or ask your own question. Should spoke tension be measured before or after adding a tube and tire? Switch to narrower rims on a hybrid? 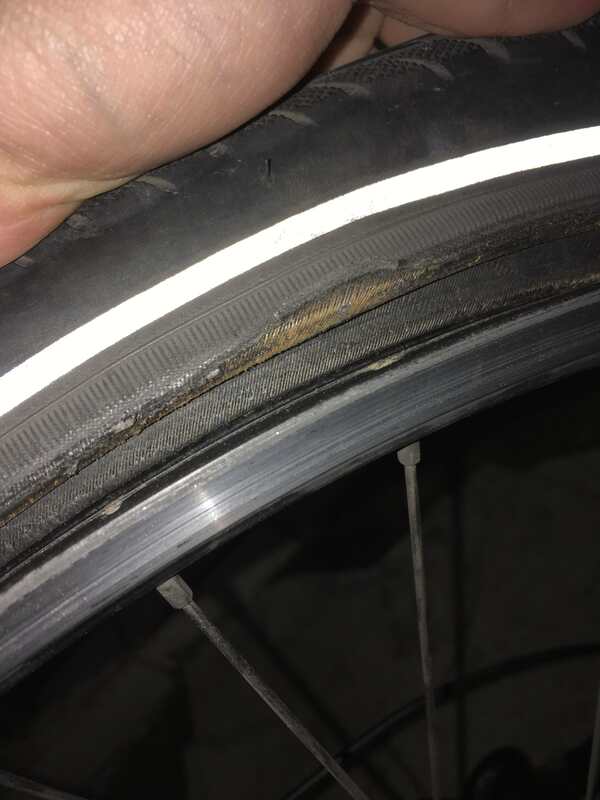 Do I have too much chafer strip showing after fixing a puncture?